Afghan authorities claimed security forces killed a senior Taliban commander they identified as the “shadow governor” of the southern province of Helmand. The Taliban denied the report, which came days after Taliban leader Mullah Akhtar Mansur was killed by a U.S. airstrike in southwestern Pakistan. Omar Zwak, a spokesman for the provincial governor of Helmand, said Mullah Muzamel had died of injuries sustained during an air strike in Marjah district late on May 22. “First he was wounded and later that night he died of his wounds,” Zwak said. Interior ministry spokesman Sediq Sediqqi said in a tweet that Muzamel had been killed in a special forces operation along with two of his commanders, Qari Feda Mohammad and Mulawi Hamid. However Qari Yousuf Ahmadi, a Taliban spokesman for southern Afghanistan, denied the report. Ahmadi said the shadow governor for Helmand’s name is Haji Mullah Abdul Manan Akhund and that person is safe. “No official has been killed or wounded in Helmand,” he said. 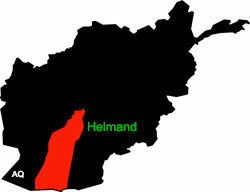 Helmand, the region that grows most of Afghanistan’s opium crop, is mostly under Taliban control but government forces have launched an offensive to retake lost ground. Traditionally, it has been the strong streaks of independent religious sentiments inside Afghanistan that kept villages, towns and cities free from complete dominations from the thuggery and hegemony of foreign aggressors for more than two hundred years- the highly-mobilized invaders experienced their utter failures several times since early 1800’s when they began declaring numerous,(direct or indirect), unilateral states of wars on the peripheries or/and inside the borders of Afghanistan. That is the reason, due to their prior first hand experience and historical knowledge, that they are so earnestly working for a special ideal deal in light of an extremely rare opportunity to neutralize the strong religious affiliations, and their supporting institutions. They are focusing on defeating and controlling the very core of the religious powerful religious cadre in the region. The western religious establishments are totally dependent and are all dancing to the harsh drum beats of their megalomaniacs; arrogant political party leaderships and bosses who are , are themselves slavishly deferring to the whims of the mega-cooperation and super-rich. That is why you don’t hear any sincere words of even simple sympathy, from the Christian and Jewish leaderships, to the plight of tens of millions of Muslims who have been suffering the brunt and ravages of the invasions and have had been especially ever since subjected to so extreme additional forms of savage negative propagandas and outright humiliations. * WARMONGERS, MEGALOMANIACS AND PARASITIC INTEREST GROUPS WILL KEEP COMMITTING THEIR CRIMES, AT THE INTERNATIONAL LEVEL, IN FRONT OF THE WHOLE WORLD, AS LONG AS THEY COULD GET AWAY WITH IMPUNITY.